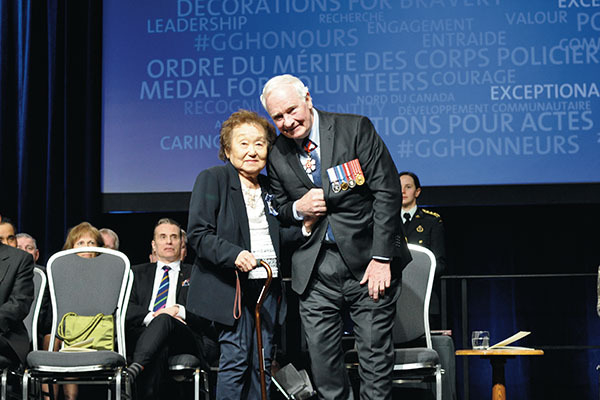 LONDON — On March 9, Pat Adachi received a Meritorious Service Award from Governor General David Johnston at the London Convention Centre. Adachi, 96, authored Asahi: A Legend in Baseball, which documented the legacy and cultural impact the legendary baseball team had on the Japanese Canadian community. 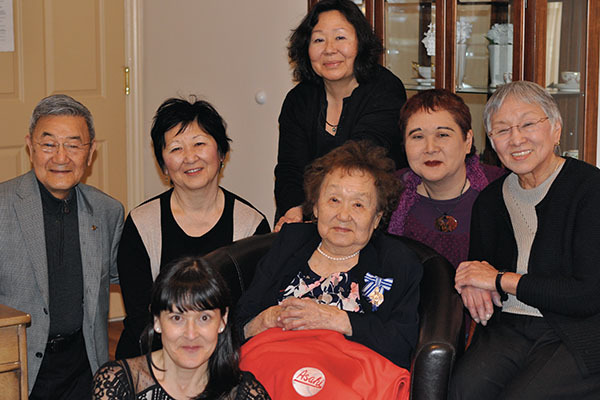 Adachi’s journey to that stage with the Governor General began 90 years ago, when she, a tomboy and eldest child by five years, would go to ball games with her father. She lived on Powell Street and the two would walk to the Powell Grounds to watch the Asahi play. Adachi says she saw the legendary shortstop Roy Yamamura play, and was captivated. “[My father] would take me all the time, buy me one of those brown paper bags of peanuts,” Adachi reminisces. Adachi would go on to play shortstop for her public school’s team when she was 12, and hoped to emulate Yamamura’s skill and love for the game. It was then that her fascination with the team was cemented. 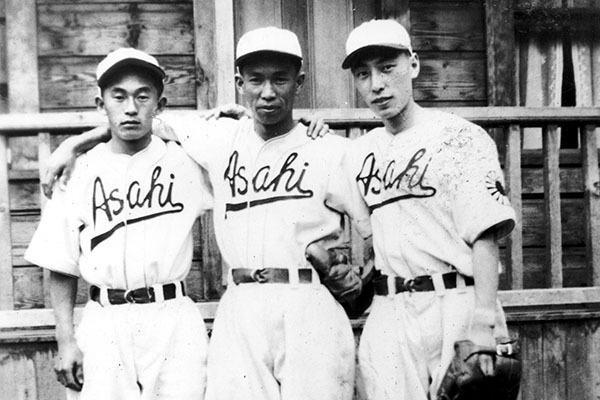 The Asahi were more than a baseball team to the Japanese Canadian community, notes Adachi. They were an impressive team, they used ‘brain ball’ before it became a popular tactic in Major League Baseball. The team would strategically bunt and steal bases to make up for their lack of size and power. The team’s strategic prowess brought in huge crowds—including Caucasians—who watched the Asahi play. The Asahi Baseball team is a story that has gone on to captivate the world. Photo courtesy: Nikkei National Museum. On the baseball diamond, the Asahi were seen as equals to their Caucasian counterparts, and helped build the foundation for Japanese Canadians to be seen as equals in a society that treated them like second class citizens, says Adachi. The team disbanded in 1941 when Japanese Canadians were relocated from the BC coast. Scattered across various internment camps, the Asahi informally played against each other. Among the few precious items they could take to the camps, they brought their bats and mitts, and provided some relief against the injustice Japanese Canadians were facing, says Adachi. Nearly 50 years later, Adachi says she remembers hearing that the player she greatly admired as a child, Roy Yamamura, had passed away, in 1990. She asked the remaining Asahi players if she could write a book about them, and they said, ‘sure, we’ll help you. Hurry up!’ Adachi laughs. 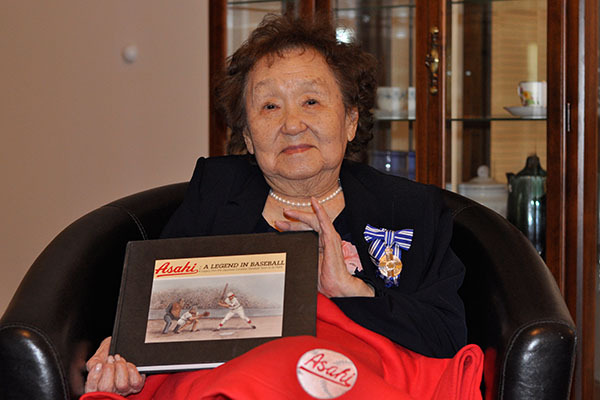 Her book is filled with team and player photos, letters from surviving players, both in Canada and Japan, biographies and statistics on each of the players and coaches as well as the history of the Asahi team. A closer look at the Meritorious Service Medal Pat Adachi was awarded at the ceremony on March 9. Photo credit: Jennifer Adachi. One of the greatest challenges Adachi, who was not an author by profession, faced putting the book together was finding the funding to finish the project. She started with a redress grant from the National Association of Japanese Canadians (NAJC), stressing that the project could not wait, as the players were passing away. It was a costly challenge to reproduce the old photographs, and as the project went along, Adachi says she would run out of money, and have to reach out for more grants, like from the New Horizons seniors group. When the book was completed, she was told it would cost $35,000 to publish the book with all of its photos. A friend suggested Adachi sell subscriptions for the book, and in just two months, 800 subscriptions were sold. Adachi also met with the minister of culture to ask for funding. With her daughter, Dale, she brought the book and told the minister the story of the Asahi. Adachi says he liked the book, and said to leave it with him for eight months, and he would give her $8,000 and help to publish the book. “It was a great offer, but that meant another year and these guys are passing away so I said, ‘Thank you very much, but I can’t wait that long.’ And he told Dale, ‘Your mother is stubborn,’” Adachi laughs. Pat Adachi holding a copy of her book, ‘Asahi: A legend in baseball’ during her interview with the Nikkei Voice. The entire process took a year, and the book was published in 1992, which was just in time, says Adachi, as three players passed away shortly after the book came out. She sent copies of the book to all the players who had moved to Japan, like Roy Nishidera. “I got word back from Nishidera, his daughter wrote to me, and said, ‘My father passed away, but he got your book in time and he had a big smile on his face,’” says Adachi. Adachi’s book was the first story published about the Asahi team, and a resurgence of interest in the team soon followed. A number of books were published after Adachi’s, who all tapped into Adachi’s expertise, like Jennifer Maruno with her series of children’s chapters books and Ron Hotchkiss’ Diamond Gods of the Rising Sun in 2013. In 2003, the Asahi team was inducted into the Canadian Baseball Hall of Fame after Adachi’s book crossed a staff’s path, and he feverishly called every Adachi in the phone book looking for her. She advocated for the team to be inducted—and quickly—as the players continued to pass away. In 2005, the team was also inducted into the BC Sports Hall of Fame. The Asahi fever pitch came to a peak in 2014, when the Japanese film, The Vancouver Asahi, directed by Yuya Ishii, starring young Japanese stars, was released in Japan. While not entirely a factual, and more a dramatic film, the story of Asahi spread like wildfire through Japan. Even the Empress of Japan knew of the Asahi when she visited Canada, says Adachi. The Adachi family and friends celebrating the day after the ceremony. Left to right: Sid Ikeda, daughter, Dale Vaillancourt, Pat Adachi, daughter, Kathy Adachi, and Marie Ikeda. Standing: Daughter, Shen Adachi. Kneeling: Granddaughter, Jennifer Adachi. When the film premiered in Vancouver in 2015, Adachi’s granddaughter, Jennifer, was amazed to see a lineup of Japanese girls with Adachi’s book, looking to get it signed. She says she saw how her grandmother had volunteered photographs and information, travelled and meeting with people to help them retell the story of the Asahi, without ever looking for anything in return. “When The Vancouver Asahi film came out, Grandma has this whole legacy of production that spun off of her book,” says Jennifer. It was then that she decided to nominate Adachi for the Order of Canada. 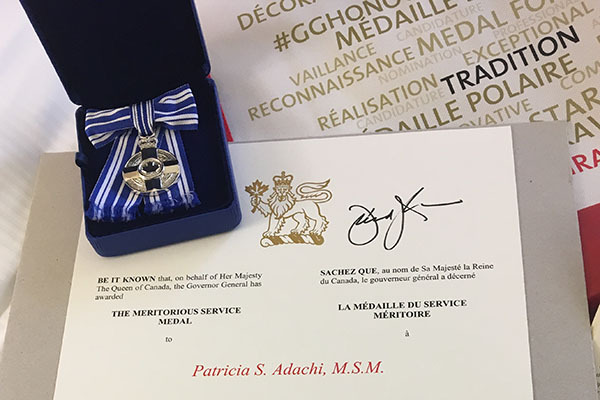 During the application process, she was referred to the Meritorious Service Award, which led Adachi to the stage with the Governor General at the beginning of March. Sitting by while Adachi was interviewed by Nikkei Voice are three generations of Adachi women. They say that there are so inspired by a woman who saw the Asahi story needed to be told, so she told it. “In adversity, she just buckles down and gets it done,” says Jennifer.